Caves in Abkhazia get deeper. 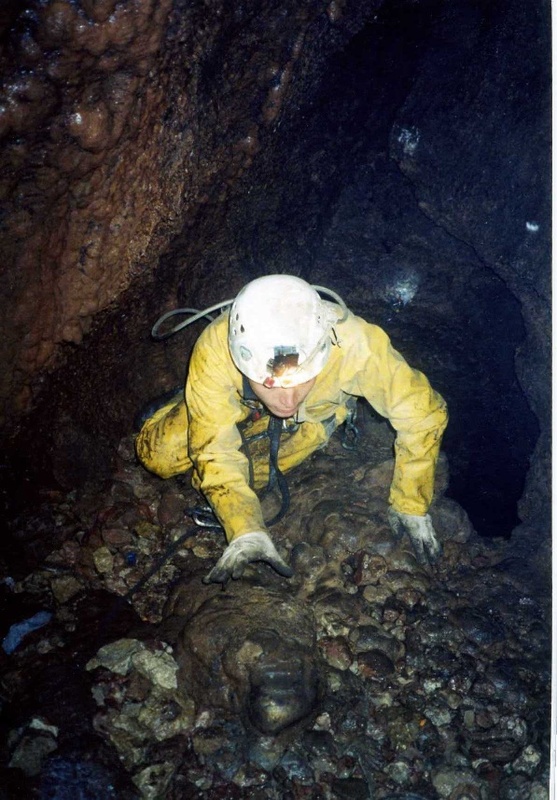 The summer season 2007 has brought some new stunning results for cavers. The top of the chart – Krubera-Voronja cave, cutting the white limestone of Arabika massif in western Abkhazia, is now the world record - 2,191 m deep. 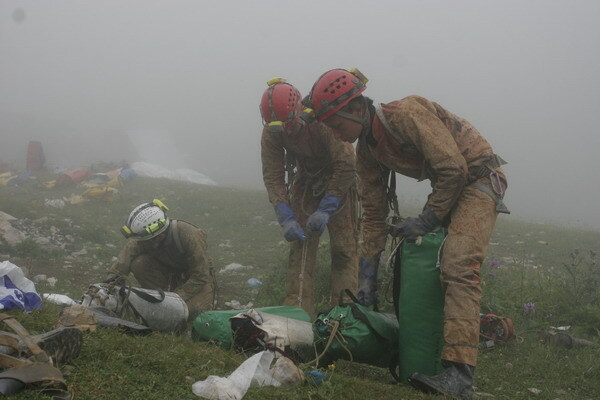 In August and September 2007 a large team of nearly 50 cavers, mainly from the Ukrainian Speleological Association, besieged the deepest cave of the Earth. 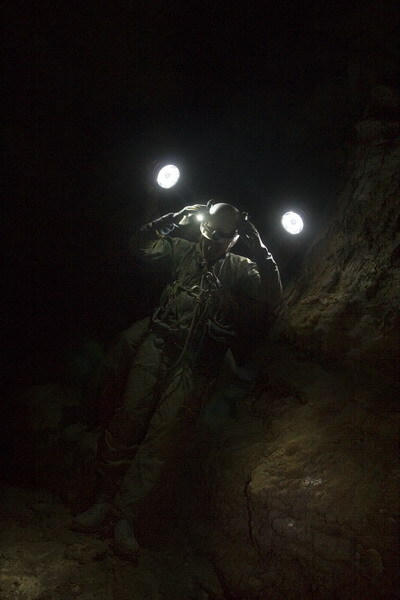 Using several underground camps the team worked its way to the final sump, called “Two captains” at -2,141 m.
Three cave-divers, the head of the Ukrainian expedition Yuri Kasyan from Kiev, Gennadij Samokhin from Simferopol and Yuri Evdokimov from Moscow dived the final sump and reached the depth of 2,191 m. The sump has a rather nasty nature, it is narrow and crooked, the passage goes up and down but still leads deeper. 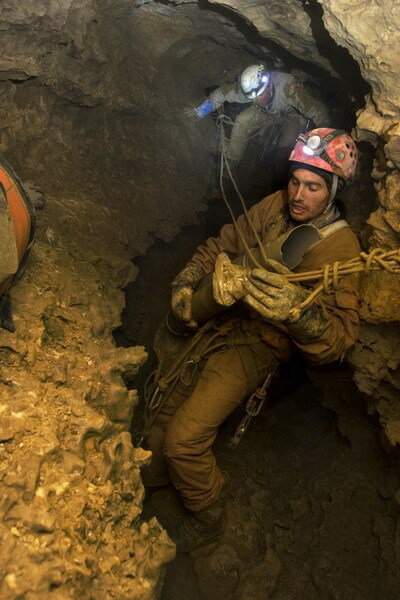 Well organized team-work allowed cave-divers to check some other sumps and branches of the cave at -1,775 and -1,920. This year, as well as previous year, all team-members worked using electric light, carbide burners were abandoned. More then a month of cave-work proved once again that electric light is fully efficient and safe, all of this years rubbish was transported out of the cave and down to rubbish tanks in the town, the rubbish around the cave was also cleared up and disposed off. The total length of cave passages reaches 13,232 m, the depth is -2,191 m.
At the same time a part of Ukrainian team worked in the Non-Kujbyshevskaja Series – which is a cave-branch separating from the main passage of Krubera at approximately -250 m. Last year a -1 kilometer mark was reached and this seasons results gave a good –1,293 m. in depth. Cavers stopped because they ran out of equipment, but this branch promises some good news in the future. The Ukrainian team plans to work on further in Krubera cave next year in August and September. 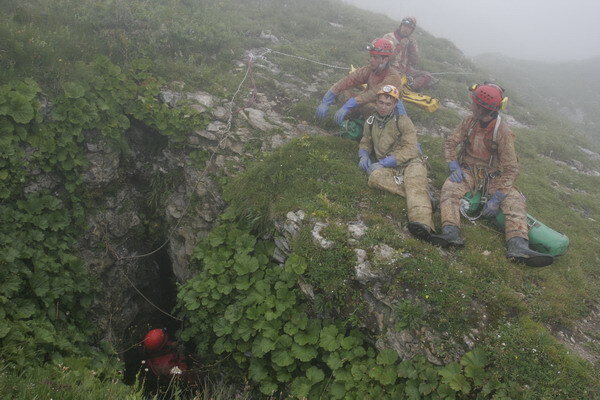 Another amazing discovery of this summer is the new depth of Snezhnaja-Mezhonnogo cave (Snezhnaja sdands for "Snowy" in Russian) on the Bzyb massif - also in Abkhazia. With its -1,370 m in depth until 2007, Snezhnaja is a legendary cave, it is long, difficult to work in and sometimes even dangerous. In 2006 a team of cavers from Moscow Center of the Russian Geographical Society made a successful descent in Illuzia cave ("The Illusion" in Russian) to approximately -700 m. The entrance to Illuzia lies 400 m up the hill from the Sneznaja first pit and according to the survey the connection was right behind the corner. 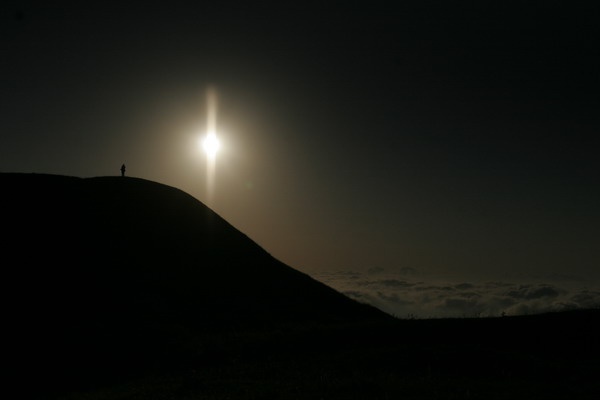 This preposition proved right, as in July 2007 a team led by Aleksey Shelepin connected Illuzia to Sneznaja, giving birth to the cave system Illuzia-Sneznaja-Mezonnogo. The current length of the system is 24,080 m and the depth is -1,753 m, which makes it the second deepest cave in the world. The caving activity in Abkhazia since the end of the conflict with Georgia is growing with each year, cavers main interests lie on the Arabika and the Bzib massifs, where several large expedition work throughout the summer-season and some even dare to come in winter. 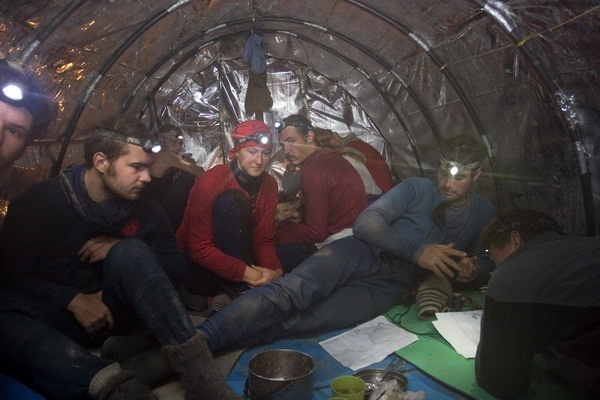 The Sarma cave (-1,543 m), Shachta Vjacheslava Pantjukhina (-1,508), Vladimira Ilyukhina System (-1,273 m), Arabikskaja (-1,110 m) and Dzou cave (-1,090 m) reassure that these massifs have a unique karst potential and further exploration would bring unique speleological results. 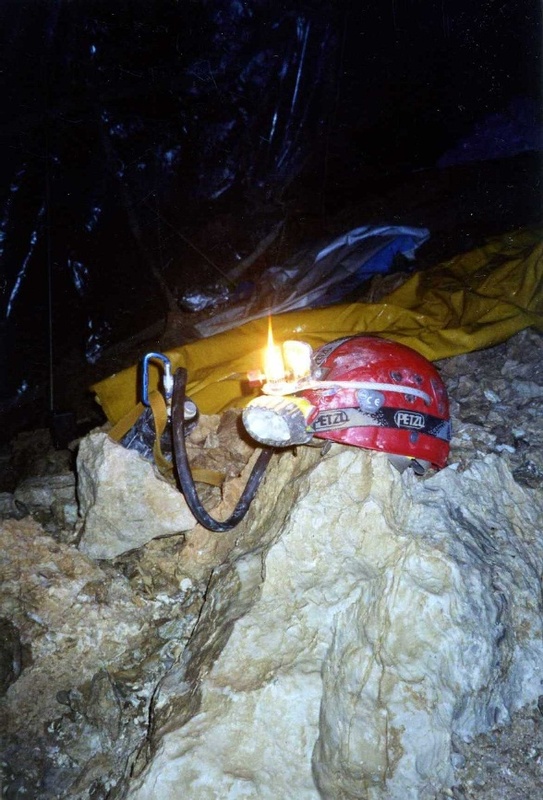 There are detailed reports (in Russian) from Yuri Kasjan on Krubera Cave and from Alexei Shelepin on Sneznaja Cave at Cavers Mailing List, and also a LiveJournal portfolio of good photos from a member of Krubera-expedition Maria Plotnikova.